STAMFORD - Figuring out what to recycle has some people going in circles. It’s because two lists are whirling around. One was standardized by the state late last year to get all towns recycling the same things. The other was updated by Stamford officials on July 1, when the city for the first time began paying a contractor to haul recyclables away, rather than earning revenue from sale of the material. Stamford has eliminated about a dozen items from its former list of recyclables. The city no longer accepts plastic bags and wrap; Styrofoam; paper cups, food take-out containers and other items made of waxed paper or cardboard; ceramics; sticky notes and sheets of stickers such as address labels; plastic six-pack holders; and synthetic envelopes used to mail packages. But Stamford’s new list doesn’t completely conform to the standardized list issued by the state Department of Energy and Environmental Protection. The state’s no-no list, for example, includes shredded paper; ice cream containers; plastic plates and utensils; and plastic bottle caps. But it’s OK to throw all of those things into recycling bins in Stamford, according to the city’s website. Vector isometric set of waste sorting cans. Icons for different kinds of waste: plastic, glass, batteries. Colorful waste cans. 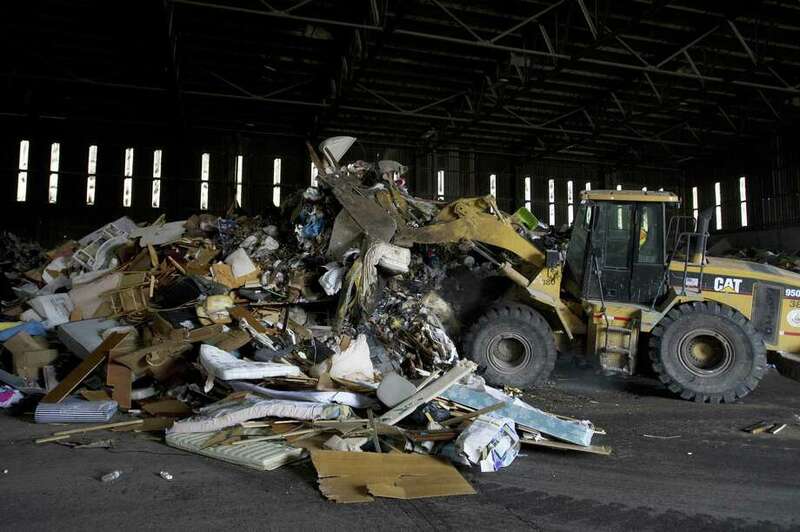 DEEP spokesman Chris Collibee said the state devised its standardized list after meeting with Connecticut recycling processors. But “if Stamford has come to a separate agreement with their (processor,) that’s what they’ve done,” Collibee said. According to the DEEP website, most recyclables in Connecticut are sent to one of six processing centers, where they are prepared for marketing to companies that use them to create new products. Some processing centers accept items on the state’s no-no list because they’ve found a market for them, it says. In Stamford, the contractor that hauls recyclables, City Carting & Recycling Co. on Taylor Reed Place, also processes them. Scale Operator Robert Rodia explained why City Carting accepts shredded paper even though it’s not on the state’s list. City Carting runs facilities in Greenwich, Darien, Norwalk and a few other towns in Connecticut, but Stamford is the only one that handles single-stream recyclables, Rodia said. “We take anything that can be recycled and if we come across something we can’t use, it goes in the trash,” he said. Recycling has gotten confusing, said Stamford resident Vicki Moon, who read a recent Advocate story about the downward-spiraling market for reusable materials. The story named some of the items on the state’s standardized list that don’t jibe with what Moon has been throwing in her recycling bin. Unfortunately, those days are over, said Dan Colleluori, the city’s supervisor of solid waste and recycling. Stamford was earning an average of $100,000 a year from the sale of recyclables, but this fiscal year will pay City Carting $700,000 to haul it away. It’s because, worldwide, demand for recyclables has collapsed as supply is increasing, causing a price plunge. Prices have dropped also because the material has become more difficult to process with single-stream recycling, which allows residents to throw all kinds of items into the same bin. Processors consider the material contaminated, making it significantly less valuable. It’s expected to stay so for the foreseeable future, Colleluori said. He sent notices to neighborhood associations encouraging residents to cut back on the amount of paper and plastic they use, and find new uses for some items, Colleluori said. “Reduce and reuse now are the key components, rather than recycle,” he said. It shows it’s OK to recycle frozen food and juice containers, milk cartons, brown paper bags, egg cartons, paperback and hard-cover books, aerosol cans, and scrap metal. Moon may print out the list and attach it inside the lid of her recycling bin. “That would help a lot,” she said.